So you decided to upgrade your current harddrive with a blazingly fast SSD. But you just installed Windows 7, all your apps, and got settled in Microsofts new OS, and really don’t wanna spend an entire day reinstalling it all again. Well, atleast that was my scenario. So would it be possible to take your current install from a much bigger harddrive over to one of the small and fast SSD’s, without reinstalling? Yes, ofcourse. And it’s not even as bad as it might seem, and best of all, it won’t cost you a daime. Proceed below to read my humble guide on how I switched from a 500 GB HDD to a 160 GB SSD. Ok, to begin this guide I’ll set up some kind of overview of what we have to do here. The scenario is; we have windows 7 installed on our HDD which is most likely bigger than the SSD we want to transfer to. Since we want to “clone” the system from one disk to another, we will need to make the size of the backup image we’re going to use smaller. If you for instance have Windows 7 installed on one big partition that is bigger than the disk you wanna clone to, the restore function of any cloning tool will tell you, that it can’t clone the image, since your target disk doesn’t have space enough. So let’s start looking at making your current system partition smaller. Windows 7 has a habbit of placing some systemfiles in the very end of the harddisk. So that means, if you have a 500 gb harddisk, all system files, and other files you might have on the drive, will most commonly be placed in the beginning of your drive, where a pagefile will be placed in the very end of your drive. We need to change that somehow, so you can resize your system partition. First thing I did was to defrag my current harddrive. Windows defrag sadly won’t do here, since it doesn’t move the pagefile, as far as I have experienced anyways. So what you need to use is PerfectDisk 10 (Get it here!). Install the trial version, and run it. 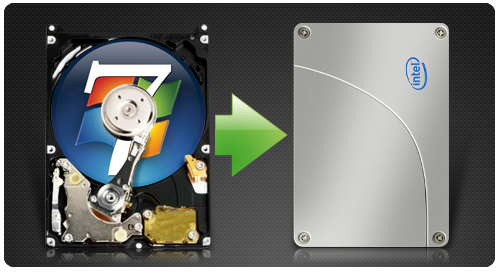 Choose to defrag your c: drive, or where ever you have your Windows 7 installed. When it’s done, simply close the program, and proceed. I personally had a 500 GB disk without any partitions except the one I used for Windows 7. Since my new SSD disk only could hold 160 GB, I clearly needed to shrink down my 500 GB partition to fit it on the new SSD. Windows own Disk Manager wouldn’t let me touch my system partition though, so I had to find a good 3rd party app, that would let me shrink my system partition. Partition Wizard is a brilliant app for this task (Get it here!). Just download the app, install it, and run it. Go set the size of the system partition c: using the rulers, press the button Apply, and reboot when it asks you to do so. I personally changed my c: partition from 400 GB to 100 GB. Windows 7 has a 100 MB hidden partition, that it brings on over to your new drive when you’re cloning, so basically, resize your c: partition to approx the size of the disk you want to clone to, minus 100 or 200 MB. When your computer has rebooted, a short status-screen will pop up during Windows loading, telling you what is going on. When that is done it will boot into Windows, and your disk has been shrinked to the wanted size. Windows 7 has a brilliant backup tool build in. Some say it’s only from Windows 7 Proffesional and up, but I wouldn’t know, since I run Windows 7 Pro here, and the tool worked for me. Anyways, we will use the built-in backup tool here, especially because it’s free, it’s very simple, and it doesn’t misallign you partition. Let me break this down in steps. You need an extra harddisk for this step, formatted in NTFS. 1. Go to Control Panel and press Backup and Restore. 2. On your left hand in the little pane there you’ll see the point “Create a system image”. Click it. 3. Your system will now scan for free space where it can put the image you’re gonna create. Once it’s done scanning, select the place where you want to place your backup, and press next. Windows will now create a system image on your chosen location. Once it’s done backing up it will ask if you want to create a repair disc. If you have the Windows 7 install disc you can simply click “No” to this, as the installation disc has the same feature. With your system image all good to go, find your Windows 7 installation disc or repair disc, and tell Windows to shut down. This is really simple. To start with, you need to unplug your HHD’s sata cable, and plug your new SSD in instead. Turn on your PC afterwards, and put the Windows 7 installation disc or repair disc into your DVD drive. Be sure that your BIOS is set to boot from the DVD drive unless there is a system disk. So, what should happen is, that your PC will boot from the Windows 7 DVD. When the installer has booted, simply choose your prefered language, as you would do when you installed Windows 7. On the next screen you get the install option. Don’t press that though. Underneath, with smaller text, is an option to repair. Press “Repair” to choose that option. Once it hits the next screen, it will ask if you would like to repair from a system image, and this is what you want. It will scan your drives, find the image you made earlier, and proceed. On a short note, I would make sure that only my target disk, the SSD, and the disk which holds the system image are connected to the PC. That way you can’t make any errors, and format any other important discs. Anyhow. Press the button to fullfill the task, and let it work. It warns you, that it will format and replace all data on the disk, but that’s fine, since that’s what we want. And aslong as you only have your new SSD disk and the disk with your system image connected, there is no worries. Now lean back, and watch it restore your system image onto your new SSD disk. Once it’s done, it will reboot, and your system is now on your new and fast SSD. If you installed Windows 7 previously with your motherboard set to AHCI mode instead of IDE mode your settled. If your motherboard runs in IDE mode though you really want to set it to run AHCI instead, since it’s faster. Some claim you need to reinstall Windows to archieve this, but that’s not true. Thing is, you need to do two very simple things to activate AHCI. 1. Activate AHCI in Windows first! There’s a brilliant guide on how to activate AHCI in Windows from Microsfot here! Since it’s written in danish, I’ll just re-write it here in english. So here’s how to activate AHCI in Windows, which needs to be done first before you activate it in your BIOS. 1a. Close all your open programs in Windows. 2a. Click Start (the windows logo in your taskbar) and type regedit in the searchfield. 5a. The value will most likely say “3”. Change that value to “0” (zero). 6a. Quit regedit, and reboot your PC. AHCI has now been activated. When your PC boots up, press Delete, F2 or whatever your BIOS prompts you to press to enter setup. When you’re inside your BIOS, go to the harddisk configuration menu. Now go to where it says SATA Setting or similar, and it will probaly stand as “IDE”. Simply select “IDE” press enter, and choose AHCI from the drop-down menu. Once it’s set to AHCI, press escape, save and exit. Your SSD will now run in AHCI mode, and gain some speed. Notice, that it is very important to activate AHCI in Windows before you activate it in the BIOS. If you do not activate it in Windows first, you’ll simply get a blue screen upon loading Windows. If that happens, just go to your BIOS and set SATA mode back to IDE, then boot Windows, and activate AHCI as described above, reboot, and jump back into BIOS and activate AHCI as described. What I did here was simply plugging my old drive back in the SATA connector while having Windows booted on my SSD. Doing it like this will prevent your old disk from booting the system rather than your SSD. Windows will find the drive, but you won’t be able to see or use it. Well, not untill you reformatted it. To do this, click on the start button, and hover your mouse over the “Computer” button. Now right-click, and choose “Manage”. In the manager, go to “Disk Management”, and find your previous system disk, ie. your old HDD from which you cloned Windows 7. In the most right side of your disk describtion you’ll see it says that the drive is offline. Right-click on the drive, and set it to “online”. Now you’ll be able to delete it’s partitions, and to reformat it. Presto, now your old drive is free again, and it won’t bother your SSD disk during boot. I hope you find this guide useful. It’s how I did it, and it works great for me. This site here has some additional tweaks for you if you use Windows 7 and an SSD. Read it through carefully though, and also note the comments. Also note, that Windows 7 will make some of those weaks on it’s own, once it detects the SSD. In the right side, double click on “WaitToKillServiceTimeout” and edit the Value Data and click on OK and close the Registry Editor. NOTE: The Value Data should be from 2000 to 20000 Milliseconds. The default will be 12000 Milliseconds. I’ve set my own to 2000, and the PC now shuts down fairly fast. Nice for reboots atleast. Great tutorial! I added a Crucial 256GB M4 to my Win 7 system. Everything went very smoothly. Changing from a 500GB drive. @fdhealy – yeah, I’d say so. Your SSD will take over, just be sure to pop out the original hdd when you’ve done cloning, so you won’t be getting conflicts in the first time booting up. When booted again, and your clone is good, you can pop in the old drive, and delete partitions/format etc.